I started my professional artistic career as a portrait artist and have now produced work for clients all over the United Kingdom. 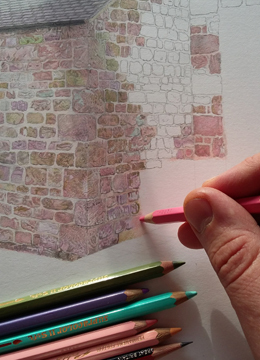 The price of an original picture will be based upon the number of hours required to complete the picture, the level of detail and complexity as well as the size of the picture. A larger size is advised with more subjects (animals or people), to get the full effect of my detailed style of work. A background can be plain or an appropriate setting. I can modified a background setting or make one up. Frequently Asked Questions might help. Please email me for a full quote with an idea of what you would like. Please go to 'Portraits' and 'Architecture' to see examples of my work. Price structure example 30 x 42cm or A3. This size and bigger has been a common size average. The size and ratio of portraits vary a lot so I'm happy to work too pretty much any. A quote is provided for free. A. I work from good quality photographs, this gets the most accurate results and avoids the sitter getting bored! It also helps to keep my prices reasonable. I do like to meet the subject if possible, and I really need a selection of sharp photos not just the one you want the portrait to depict. I am quite happy to work from either digital pictures by email or memory stick. Q. What are they produced in? A. Most of the examples of my work are drawn in graphite pencil and fine grade colour pencil, this is absolutely the best medium for me to show the fine detail characteristic of my style. However if you want a piece in a different medium I am happy to discuss your ideas. Q. Is there a waiting list? How soon can I get a picture? A. I do have a diary and I have to allow each picture a time slot to be produced and then time to return and refine, Certain times of year, especially September to December, are very busy so if you want your picture to be ready for a specific date then book early! A slot in my diary isn’t secured until I receive your deposit. Q. Can you do a picture for a special occasion or as a surprise? A. Yes, a lot of my work is commissioned as a present but please give me details so that I can help you keep the secret and ensure timely delivery. I am also hoping to offer gift vouchers soon. Q. What if I want more than one subject in the same picture? A. This is no problem, I can put two or more animals, people or a mixture of the two on one picture. You don’t even need to have a photograph of them together I can work from separate photos. Q. When do you need the photos? A. I don’t need the photos immediately when you book, if you choose to supply photos I will agree a date when you must supply the photos. If I am taking the photos I will arrange an appointment in good time. Please note that failure to supply photos as agreed may lead to forfeiting your deposit. If I need to take photographs of the subject to work from I take £50 - £150 up front. The amount is at my discretion according to location and time involved. This charge will be part of the total cost of the finished piece of art. The photography part is a none refundable part of the process towards the final piece of art where I include travel, time and expertise in acquiring what I need. You are not required to go ahead with the commission after this stage. Q. I’m not a very good photographer, what should I do? A. I can take the photographs for you, in fact I prefer to. But you get the final say on which photos we use. I will quote a price for this service when you commission a picture. Q. Can you frame the picture for me? A. Yes, this is something you can decide at the start or go away and think what frame design would best suit your taste. If you don’t want the picture framing then let me know at some point before I am ready to finish the picture. Framing is not included in the price unless specifically agreed. Q. Can you do other subjects? A. Yes, I am always looking for exciting new ideas! If you would like a picture of anything you don’t see here let me know, I might be able to offer a special rate for new ideas. Q. What should I do if I want to commission a picture? Q. How much is a portrait? I accept payment by card machine upon collection of work or out at shows. A. At the point of booking my services to produce the piece of art I like to take a 30% deposit. Once you have paid your deposit I will book you a slot in my diary. The date may change if there is a hold up in relevant source material or a change of mind when due to start work. The balance does not need to be paid until completion. Please remember I take an amount for photography if my services are needed to rather source material to work from. This amount is part of the total work involved in producing a commission. A. A Wikipedia explanation of Giclée is best to explain! Please be aware I now include Artist's Proof (A/P), in my prints for sale. If you see e.g. A/P1 instead of e.g. 21/195 you are looking at the early test prints that are worth more to collectors. I have been very impressed by the quality, Giclée is definitely as good as older printing press process. I don't always sell the right sizes at art fairs for clients so please enquire! and either me or my wife Katherine will contact you back.